Call (215) 558-5258 for a free in home consultation. Serene Home Care Agencies Home Health Aides and Caregivers are Trained to provide outstanding service to it clients. Serene Home Cares vision is to assist people in the comfort of there homes to maintain a safe, independent and dignified lifestyle with choice, control and freedom. SHCA was founded by Ericka Koumare after struggling with several of my own family members to find reliable care. As a result I opened SHCA with the mission of providing reliable care tailored to the individuals needs and to promote health,wellness and safety for every individual it services and their family. Serene Home Care has person centered staff and services tailored to meet each of their clients individual needs. They provide service with a smile and support that makes my relative feel comfortable, safe and well cared for. 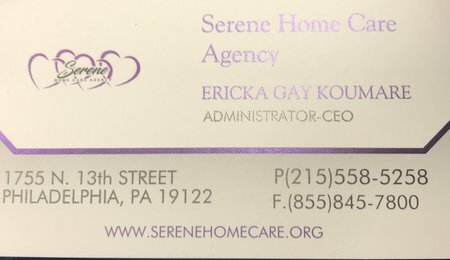 I would recommend Serene Home Care for all of my friends and family members who are looking for an agency to feel at home with. The care is excellent!! !